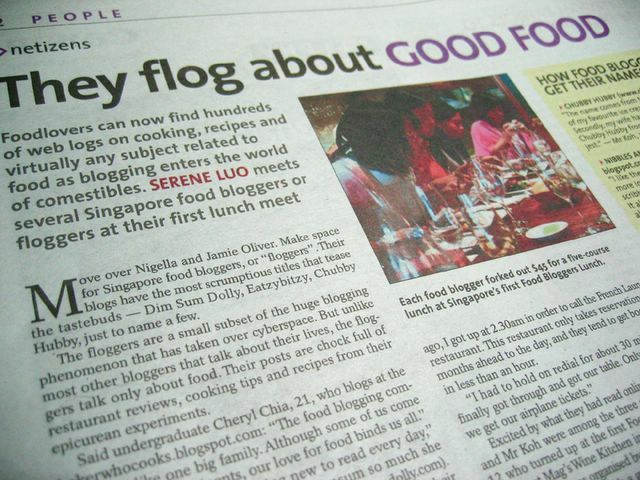 Some of us local food bloggers (or floggers for that matter) got mentioned in an article about the food blogging community this tuesday in Strait’s Times Digital Life. Seems like we’re making a mark in the blogging community, no? My… it’s been four months since I started this food blog. Time zooms by ya? But not to worry, I promise to continue whetting your appetites and try to hypnotise you people to lick your screens. congrats on making your mark in the Sporean food blogging community! hehe. congrats!! Im so surprised that the paper is in English. English is the spoken language here and the artice you see there was published in The Straits Times, our national newspaper.